Applying a power trowel finish to silica fume concrete can certainly be done, if the requirements of the project dictate. This step should not be required for most applications. It may be necessary for heavy-duty floors or floors in food processing areas. To apply this type of finish, the contractor must wait until the concrete has gained enough strength to support the weight of the finisher and the trowel. 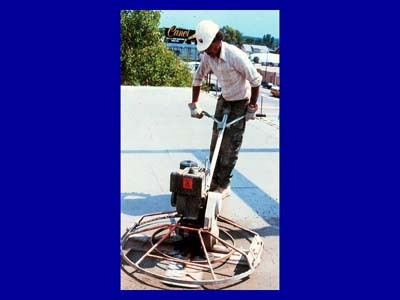 The silica- fume concrete must be protected from drying during this waiting period. Usually, such placements are done by specialty contractors who are familiar with the requirements for more complex floor finishing.